Oscar Mmari (’14) is a Wooster Geology alumnus who did field work in Israel as part of his Independent Study. After his graduation he has had excellent geological experience in Africa and Europe, most involving mining and other resource-related industries. He has kindly given us this account of a field trip he took on August 4, 2015, near Dar es Salaam, Tanzania. A Dar es Salaam traffic jam, like those in most African cities, is a memorable experience for anyone who has braved the streets of the commercial capital. The narrow roads are constantly chocked with sluggishly moving cars and fumes suffocating the air. This can be inconvenient and people have missed flights let alone been tardy to momentous meetings. It is a far cry from the orderly multiple-lane highways spanning through Ohio. Equipped with this knowledge, our trip to four different outcrops spanning two regions all in one day had to be immaculately planned. 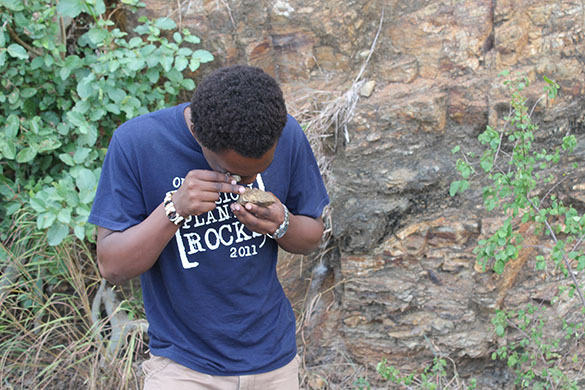 Geology field trips are vital to the growth of every geoscientist. The trips, apart from allowing geologists visit exotic places on earth, reinforce fundamental field skills important to the discipline. In addition, it underscores the scale difference between outcrops in the field and seismic wiggles in Petrel. This is why when my supervisor was in town, I organized a field trip. 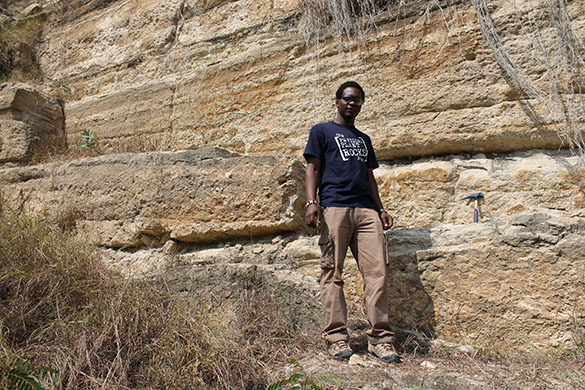 The overarching theme of the trip was to observe different sedimentary successions in the Coastal area around Dar es Salaam. Additionally, one of the outcrops provided an analogue to Songo Songo gas field. Geological outcrop analogues serve a great purpose in understanding new fields because of their capability of providing information at a scale and lateral that cannot be determined from seismic and well data in the subsurface. 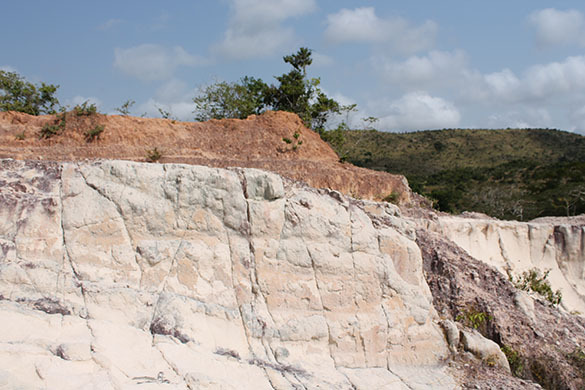 Songo Songo gas field is a Lower Cretaceous reservoir aged Neocomian to Albian sandstone reservoir producing 80 MMscf/day for gas plants in the United Republic of Tanzania. 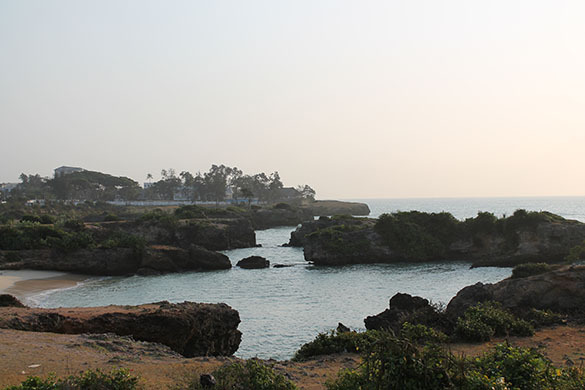 The trip started early at 7:30 am and the first stop was just a few yards from the office in Dar es Salaam. Oyster Bay plays home to host of different marine organisms that congregate in and around an extensive coral environment. Corals provide shelter and food for many organisms and can support enormous ecosystems. As the sea level changed, the effects of waves and tides on these rocks can be seen especially in the neatly exposed corals on the beach. Being geologists, we spent some time looking at fossils and the sedimentary fabrics pondering about the effects of deposition and erosion in the area. The second stop was a little further from the office. The Pugu Hills are located about 15 miles south-west of the BG Tanzania office but the outcrops we were trying to find were elusive. 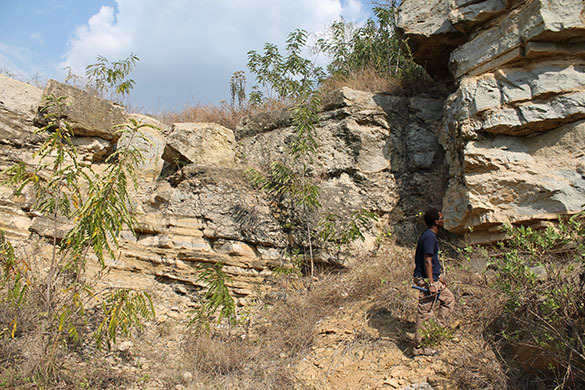 After asking several locals, making a few phone calls to colleagues and gingerly passing along overgrown ancient roads, where the GPS was not very helpful, we reached the former kaolinite quarries in Pugu. The Pugu Hills form one of the highest points in the region due to uplifts within the last 5 million years. The sediments in the quarry are amalgamated fluvial sandstones with gravel lags, which are cut by a number of NNE trending faults and joints. 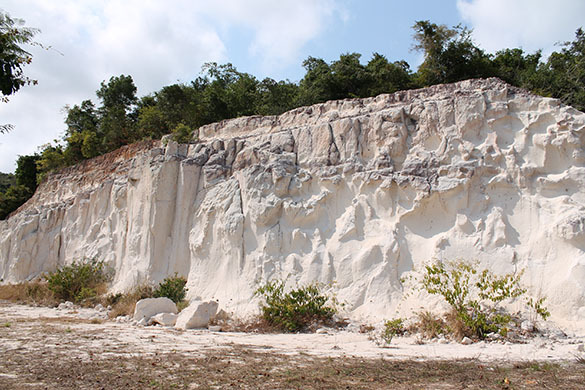 The intensely weathered sandstone-clay sequence is now dominated by the clay mineral kaolinite which provided raw material for the now dilapidated factory and was extracted for pottery manufacture. It also contains refractory minerals such as quartz and zircon which are resistant to alteration. 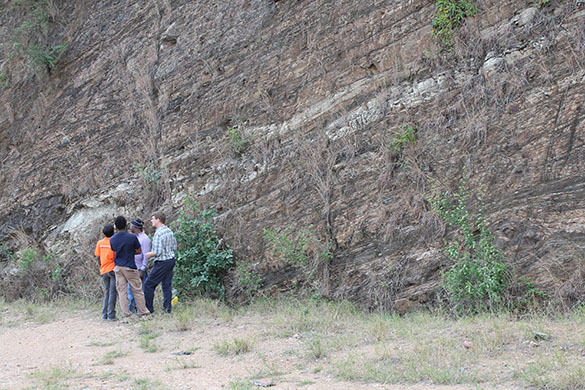 The next stop, after an excellent lunch, was at Msolwa area were we looked at Lower Cretaceous fluvial and estuarine sand deposits, which are of similar age as the gas-bearing sands of Songo Songo. We spent some time discussing the direction of flow and the possible depositional environment. The last stop was in the Wami River valley where we observed metamorphic rocks uplifted to the surface and an impeccable sedimentary-metamorphic contact. On our way back we saw several signs of the on-going hydrocarbon exploration in on shore Tanzania, which was an optimistic sign in the current oil price climate. When we got back to the city, it was dark, we were tired, but it had been a day well spent. The traffic was jammed solid and there was no clever planning that would get us out of this one. Well, at least we had to some rock stories to discuss.